Portfolio Categories: Case Studies, Degassing, and Vapor Control. A West Coast oil company needed to purge 20 miles of pipeline with crude and hydrogen sulfide vapors. The oil company needed a solution to vapor degas this large volume of crude and H2S vapor from this pipeline to allow pipeline repairs. Safe degassing of the vapors also ensured that odors and toxic vapors did not contaminate the neighborhood. 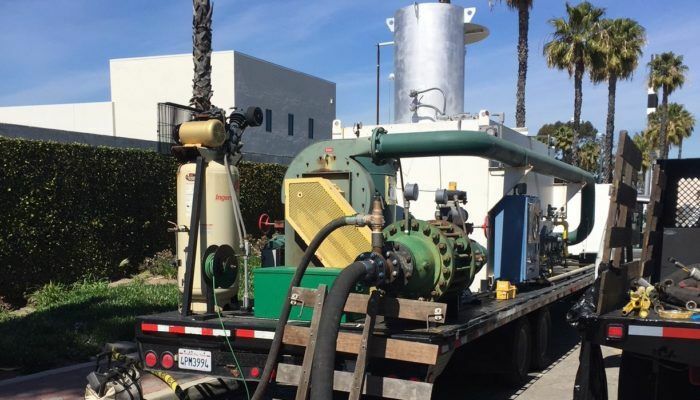 Envent offered an engineered solution for this industrial degassing project. Envent provided a vapor-liquid separation vessel and then to the EMTOS (Envent Mobile Thermal Oxidizer System). The vapor-liquid separation vessel was set up to handle up to 100 BBL of liquid product if needed, and the EMTOS unit was optimized to handle up to the hydrogen sulfide. High-pressure flange hoses were used to ensure leaks didn’t occur. During the project, 60,000 SCF of vapor were safely depressurized from 100 PSIG to 0 PSIG in less than an hour. Less than 10 BBL of liquid product were received in the separation vessel. The midstream oil company realized both cost and a safety benefit through Envent’s industrial degassing solution. 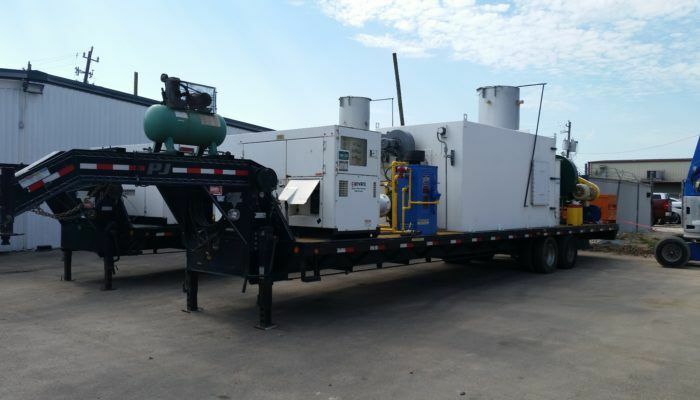 With the nitrogen depressurization taking less than an hour, a large amount of time was saved when compared to alternative solutions allowing pipeline work to be performed in a safe manner. It also eliminated the requirement to report an EPA benzene release (anything over 10 lbs. per day of benzene is a reportable quantity). This pipeline was safely and successfully degassed.